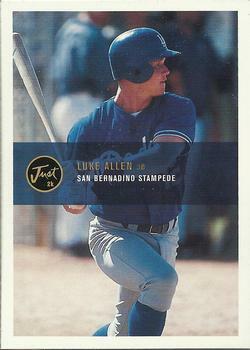 I have one card of Luke Allen, from 2000 Just. Playing career: Outfielder Luke Allen played twelve seasons of professional baseball, reaching the major leagues with the Dodgers in 2002 and the Rockies in 2003. In eight big league games he hit one double in nine at-bats but scored two runs. Where he is now: An instructor at Diamond Sports Academy in Covington, GA.
Google Autocomplete results: He is second when you type Luke Al, between Luke Allen-Gale, an actor, and Luke Allen FDNY, a firefighter. Another prominent Luke Allen is the punter for the Stony Brook University football team. Coming up next: The next profile will be Justin Atchley. First baseman Andre Keene played in the Giants organization from 1991 to 1995. Known for his power, he hit .273 with 42 HR and 239 RBI in 384 games. 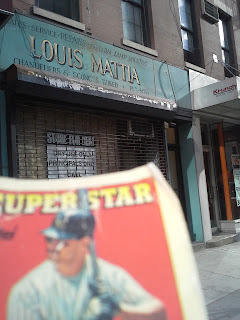 Now an independent business owner at ACN, he kindly answered my questions about baseball cards. 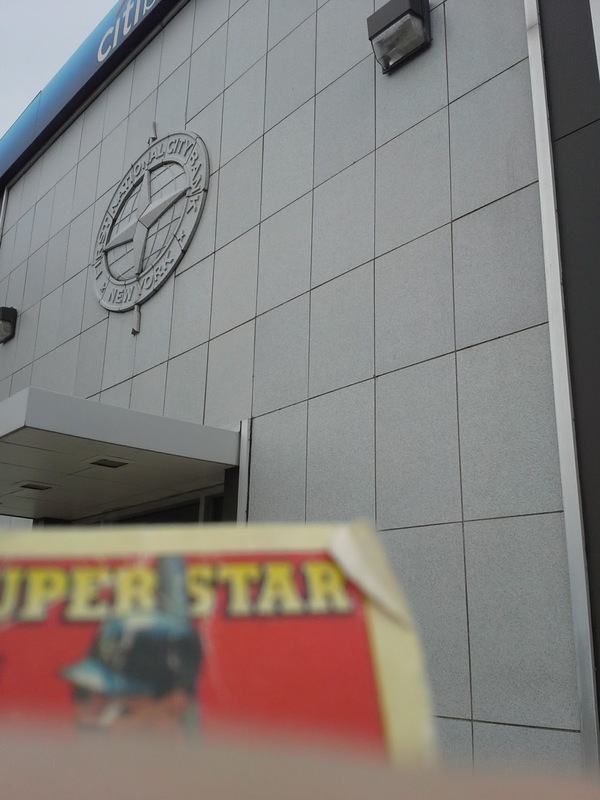 "My favorite card of myself is the Upper Deck card. I don't really collect cards, I have a few of guys that I became friends with." Brad's Blog recently had a giveaway, and he sent a really awesome, generous package. Here are some highlights. This sure was an eye-catching card right at the front of the package. A shiny Mariano Rivera card! Of course, anybody looks good on a shiny card in a Yankee uniform. Hector Noesi was decent as a Yankee in 2011; I was a little disappointed that the Yankees traded him to Seattle in the Michael Pineda deal. I needn't have worried, I guess; Noesi is 10-29 in four seasons since that trade. A nice, simple Lou Gehrig card, but what immediately caught my eye is the prominent patch for the 1939 World's Fair. Interestingly, that patch was worn in the 1938 seasons but not 1939. I have two cards of Wes Anderson. This one is from 1999 Just. 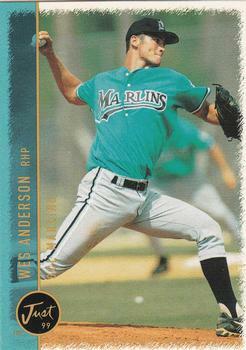 Playing career: Wes Anderson started his career with three solid seasons of rookie league and A-ball, going 20-16 with a 2.86 ERA. However, injuries stalled his career as he only appeared in sixteen games over the next three seasons. Where he is now: A Senior Vice President at Bank of the Ozarks in Little Rock, AR. Google Autocomplete results: He is second when you type Wes , between Wes Welker, the Rams wide receiver, and Wes Craven, the late film director. There are no references to the ballplayer on the first page of Google results; all refer to a film director of that name. 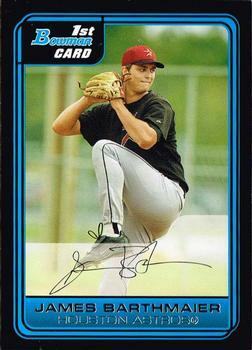 Mike Drumright pitched for nine seasons in the minor leagues, mostly in the Tigers and Marlins organizations. His best season was 1996 when he went 6-4 with a 3.97 ERA at AA Jacksonville. Now the Manager of Artistic Marble & Granite in Wichita, KS, he kindly answered my questions about baseball cards. - Do you have any stories about cards of yourself or of other players? I remember the first time I signed a card contract and that experience was pretty memorable. I was sent boxes and boxes of cards to sign with dozens of pens to sign thousands of cards. It took several weeks and lots of pens, but I recall how badly my hand hurt and hard it was to replicate your signature that many times in a row. - Do you have a favorite card of yourself or of another player? Now that I am way older and have been retired, they are all my favorites. I think my kids have enjoyed sharing that their dad has a baseball card. - Do you collect baseball cards? I don’t collect cards anymore and haven’t for a very long time but I used to as a young boy. My dad helped me and my younger brother learn how to collect cards and that was something we did together for many years. I still have all my cards stored away somewhere. I have one card of Dusty Allen, from 2001 Fleer Triple Crown. Playing career: First baseman-outfielder Dusty Allen played seven seasons of professional baseball, reaching the major leagues in 2000 with both the Padres and the Tigers. In 27 big league games he hit .250 with 2 HR and 2 RBI. Where he is now: A serial entrepreneur whose current projects include identity protection company LibertyID. 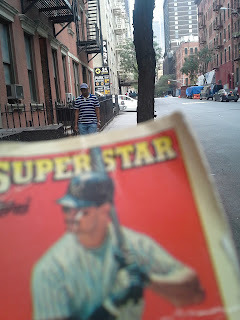 My memories: Last year he kindly shared his thoughts on baseball cards with this blog. Google Autocomplete results: He is first when you type Dusty Al, ahead of Dusty Always Sunny, referring to a character on a TV show. Another prominent Dusty Allen is a Media Relations Specialist at Lululemon. 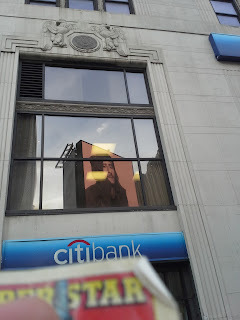 First National City Bank changed its name to Citibank in 1975. This branch in Freeport, NY, has the old First National City Bank seal on the exterior - a seal that is now 40 years out of date. This branch across the street from Penn Station in Manhattan has an even older seal. You have to click on the image and zoom in to see it, but this seal just says National City Bank, meaning it predates the 1955 merger of National City and First National to create First National City. I have one card of Cedric Allen, from 1996 Fleer Excel. Playing career: Cedric Allen pitched in the Reds organization from 1994 to 1996. In 64 games he went 27-13 with a 3.03 ERA. These are obviously very solid numbers; don’t know if injuries or something else ended his career prematurely. Where he is now: A coach at Urban Elite Sports in Missouri City, TX. Google Autocomplete results: He is third when you type Cedric Al, between Cedric Alexander vs. Candice LeRae and Cedric Alexander Cagematch, both of which refer to a wrestler. Another prominent Cedric Allen is a pastor in Atlanta. Coming up next: The next profile will be Dusty Allen. It has been many years since you could find a Roy Rogers anywhere on Long Island. Today they are mostly in Maryland and Virginia with a few elsewhere. This Roy Rogers was converted into a medical building many years ago. Recently the exterior of the medical building was torn down for construction, revealing the old restaurant that still makes up the skeleton of the building's first floor, with the labelscar from the old Roy Rogers sign clearly visible. I'm not sure when the last time this was an actual Roy Rogers; this New York Times article mentions a Roy Rogers in Oceanside becoming a Pizza City in 1987, and the address was later a Pizza Hut, so this might be the right place, making the Roy Rogers sign almost 30 years out of date. 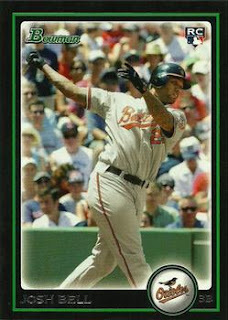 I have one card of Winston Abreu, from 1996 Fleer Excel. Playing career: Winston Abreu signed with the Braves as a 17-year old in 1994, making his professional debut that year. He spent twelve years in the minor leagues before finally making the major leagues in 2006 with Baltimore. He also pitched for Washington in 2007 and Tampa Bay and Cleveland in 2009. Overall in 38 major league games he went 0-1 with a 7.31 ERA. Where he is now: In his 20th season in professional baseball in 2015, he had an excellent year as the closer for the independent league Joplin Blasters. In 47 games he went 5-1 with 23 saves and a 0.77 ERA, striking out 80 batters in just 47 innings. Google Autocomplete results: He is fourth when you type Winston Ab, between Winston Abraham, a former Australian Rules footballer, and Winston Abby’s, a pizza place in Oregon. There do not appear to be any other Winston Abreus. Coming up next: The next profile will be Cedric Allen. 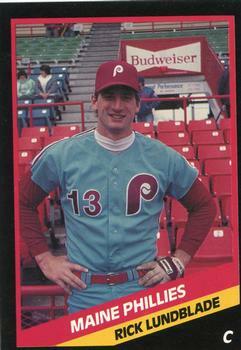 C-1B Rick Lundblade played six seasons in the Phillies, Mets and Orioles organizations. In 455 games he hit .266 with 54 HR and 246 RBI. 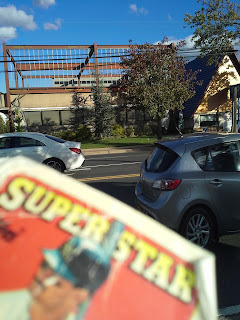 Now a personal injury and sports/entertainment attorney with a law firm - Rick Lundblade Law - with offices in Oregon and California, he kindly answered my questions about baseball cards. "Probably my favorite card would be the Maine Phillies cards from 1988. If I recall correctly, there are two such cards, although I would not be able to remember the companies that produce those cards. They are probably my favorites because they were representative of my first season in AAA ball. I do not collect baseball cards currently. I was an avid collector of baseball cards when I was a young kid back in the 1970's, when Topps was the only company making baseball cards. Somewhere, a collection of cards remains. If I recall correctly, the value of baseball cards underwent a financial change back in the 1990s. I would have no idea as to the value of cards today. All I can tell you at this point as I can recall that I still somewhere have Johnny Bench and Nolan Ryan rookie cards that apparently had some significant value 20 to 25 years ago. I always thought it was pretty remarkable that a small piece of cardboard could hold that type of value!" Thanks! I don't have either of those cards (the black border is CMC, the gold border is ProCards) but I do have his Tidewater card from ProCards. Though the building says Oceanside National Bank, there has not been a bank with that name for years, if not decades. (The last reference I could find to it online dated from the 1970s). 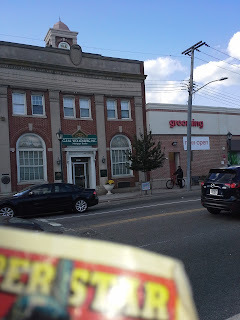 However, it is still a financial institution, home now to Wolkenberg Mortgage. I have three cards of Josh Bell. This one is from 2010 Bowman Draft Picks & Prospects. Playing career: Third baseman Josh Bell played for the Orioles and Diamondbacks from 2010 to 2012. In 100 games he hit .195 with 4 HR and 22 RBI. Where he is now: Anyone know where Josh Bell is now? Google Autocomplete results: He is fifth when you type Josh Be, between Josh Berry NASCAR, a race car driver, and Josh Bernstein, host of the TV show “Digging for the Truth”. The first entry when you google Josh Bell is not the ballplayer but a classical musician. Coming up next: The next profile will be Edwin Bellorin. 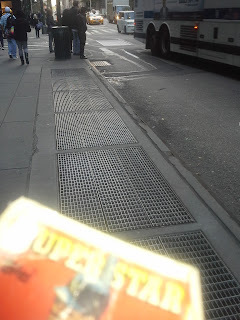 It was at this Lexington Avenue subway grate in 1954 that Marilyn Monroe filmed her famous skirt-blowing scene for the movie Seven Year Itch. The filming drew a huge crowd who watched Monroe act out the scene with several takes (none of which were used in the film - they ended up refilming in a Hollywood studio). Monroe's husband, former Yankees legend Joe DiMaggio, was at the filming, and, infuriated by his wife's exhibitionism, filed for divorce shortly after. I have one card of Chris Begg, from 2007 Bowman Chrome Prospects. Playing career: Chris Begg pitched in the Giants organization from 2003 to 2008. In 117 games he went 53-31 with a 3.53 ERA. He appeared in two World Baseball Classics for Team Canada. Where he is now: Teacher and baseball coach at Everest Academy in Thornhill, ON. Google Autocomplete results: He is first when you type Chris Beg, ahead of Chris Begley, an archaeologist. The first entry when you google Chris Begg is not the ballplayer but the CEO of East Coast Asset Management. Coming up next: The next profile will be Josh Bell. Louis Mattia owned a famous lamp sales and service store on 2nd Avenue and 52nd Street from 1960 to 1995. He was renowned for making custom lamps out of objects like musical instruments, fire extinguishers and even a human skull. The location is currently between renters and the old sign is visible again. Check out the old PLaza phone exchange on the sign. 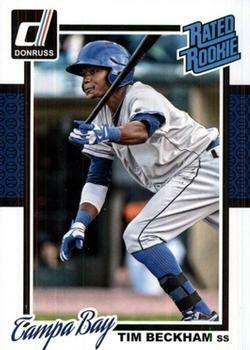 I have one card of Tim Beckham, from 2014 Donruss. Playing career: Shortstop Tim Beckham was the Rays’ first-round pick in 2008, and slowly made his way through their system. He briefly made the major leagues in 2013, but missed 2014 due to injury. Where he is now: Played in 82 games for the big club in 2015, hitting .222 with 9 HR and 37 RBI. 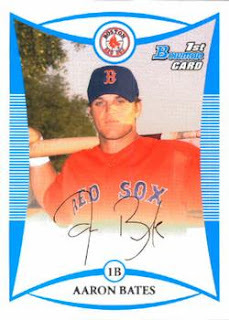 My memories: I remember him and Gordon Beckham coming up around the same time and both being somewhat high-profile busts. Google Autocomplete results: He is tenth when you type Tim B, behind Tim Benz, a sports radio host in Pittsburgh. There do not appear to be any other prominent Tim Beckhams. Coming up next: The next profile will be Chris Begg. Forgot this one when I posted my Chicago wallet card photos last month. 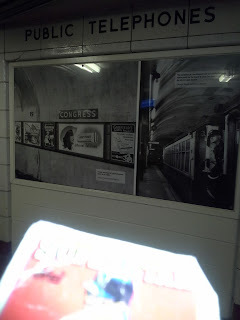 The LaSalle station on the CTA Blue Line used to have a spot for public phones. 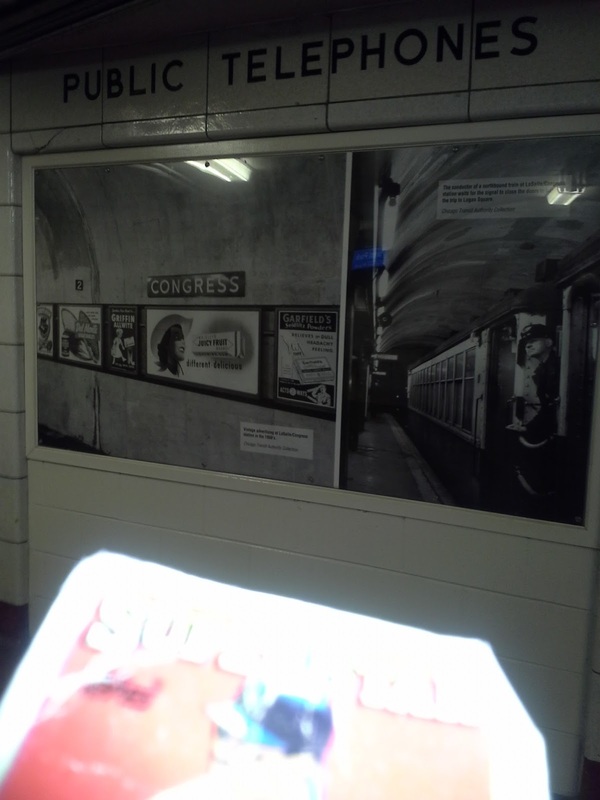 Those antiques are no longer necessary, so there are now some historical photos in that spot. I have one card of Joe Bauserman, from 2006 Bowman Prospects. 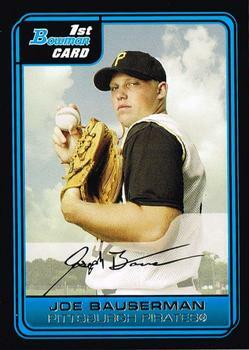 Playing career: A star pitcher and quarterback coming out of high school, Joe Bauserman chose baseball when he was drafted in the fourth round by the Pirates in 2004. In three minor league seasons he went 14-12 with a 3.43 ERA. Interesting facts: After the 2007 season Bauserman decided to return to football. He made the Ohio State team as a backup quarterback and was solid in the role. He was promoted to starter in his senior year but struggled, and ended the 2011 season as a third-stringer. 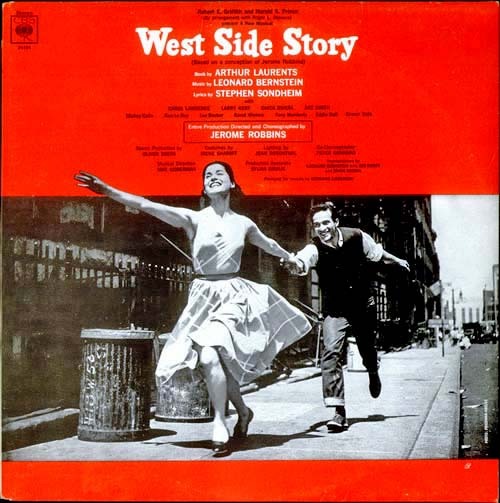 Where he is now: Anyone know where Joe Bauserman is now? Google Autocomplete results: He is first when you type Joe Baus, ahead of Joe Bausch Golf, a golf course architecture enthusiast. There do not appear to be any other Joe Bausermans. Coming up next: The next profile will be Tim Beckham. 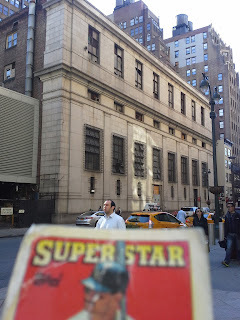 Here is Wallet Card at 418 W. 56th Street, site of the original West Side Story album cover. I have one card of Aaron Bates, from 2008 Bowman Prospects. Playing career: First baseman Aaron Bates played eight seasons of professional baseball, reaching the majors with Boston in 2009. In five games with the Red Sox he hit .364 with 0 HR and 2 RBI. Where he is now: A coach for the Dodgers Arizona Rookie league team. Google Autocomplete results: He is first when you type Aaron Bat, ahead of Aaron Bath, a plumbing fixture gallery in New Jersey. Another prominent Aaron Bates is an insurance agent in Arizona. Coming up next: The next profile will be Joe Bauserman. The Penn Station Services Building was actually built in 1908, two years before Penn Station itself. It provided electricity, heat and other functions to the railroad, and remained in that role after the original station was razed in the 1960s. Eventually the functions all moved off-site, and by 2008 the building was empty but is being renovated to be reused again with Penn Station's expansion over the next few years. I have one card of Bobby Basham, from 2003 Bowman. Playing career: Bobby Basham pitched in the Reds and Padres organizations from 2001 to 2007. In 67 games he went 22-24 with a 3.89 ERA. Where he is now: Assistant Director, Minor League Operations for the Chicago Cubs. Google Autocomplete results: He is first when you type Bobby Bas, ahead of Bobby Bass, an actor. Another prominent Bobby Basham owns an auto upholstery business in Kentucky. Coming up next: The next profile will be Aaron Bates. Shortstop Alvaro Espinoza played twelve seasons in the major leagues, mostly for the Yankees and Indians. An excellent fielder, he hit .254 with 22 HR and 201 RBI. Now involved in various levels of youth baseball instruction, he kindly (if briefly) answered my questions about baseball cards. "Well I love all my cards, I collect only just my cards lol." The Orioles' ninth-round pick in 1988, Mike Linskey got off to a fast start to his professional career. In 1989 and 1990 at AA Hagerstown, he went 17-7 with a 2.41 ERA. Unfortunately injuries prevented him from making the major leagues, despite putting up good career minor league numbers (50-42, 3.64 ERA). Now a Business Performance Advisor at HR services provider Insperity and the owner of Houston Youth Baseball, he kindly shared this baseball card story. "My Bowman Orioles card, if you look closely on the glove you will see a nickname written in black. The name Nuke was given to me from that era movie Bull Durham. Still have folks that have seen that card call me Nuke out of the blue, and I always turn around to look. Oh glory days." I have one card of Luke Bard, from 2012 Donruss Elite Extra Edition. Playing career: Luke Bard was a first round pick of the Twins in 2012. He struggled with injuries from the outset. He pitched in seven games in 2012, twelves games in 2013 and missed the entire 2014 season. Where he is now: Finally healthy in 2015, Bard had an excellent first full professional season. 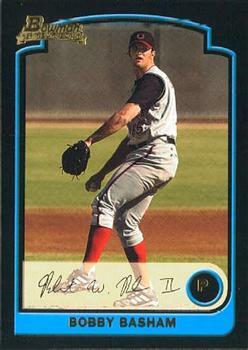 In 28 relief appearances at Class-A Cedar Rapids, he went 7-1 with a 2.41 ERA. Interesting fact: His brother Daniel Bard has pitched in the major leagues. Google Autocomplete results: He is first when you type Luke Bard, ahead of Luke Barden, a composer. Another prominent Luke Bard is a research meteorologist. Coming up next: The next profile will be Bobby Basham. Roger Erickson pitched for the Twins and Yankees from 1978 to 1983. In 135 games he went 35-53 with a 4.13 ERA. 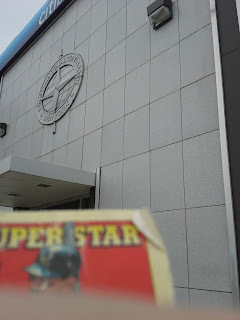 Now the owner of the Erickson Baseball School in Clarkesville, GA, he kindly answered my questions about baseball cards. "cameramen always would take pictures early in the morning in spring training when everyone was not ready. Also they always wanted you do a goofy pose so I started giving them just the stretch position pose. Favorite card - probably the Twins card of me throwing and unshaven for 3 weeks - I did not have much growth on my face though. Can not grow a beard - Ha I do not collect other than extra given to me but my Dad collected from the time I was in big leagues." Outfielder Sixto Lezcano played twelve seasons in the major leagues, mostly with the Brewers. His best season was 1979, when he hit .321 with 28 HR and 101 RBI, and won the Gold Glove. 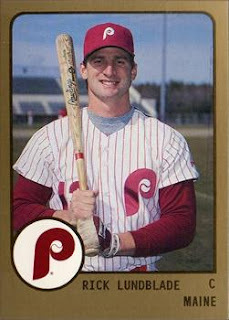 Overall he hit .271 for his career with 148 HR and 591 RBI. He kindly answered my questions about baseball cards. "Since I was a kid in Puerto Rico used to buy, collect and trade baseball cards. One time I had all cards of all major league teams but one, Del Crandall, and to my surprise he was my first Big League manager with the Brewers in 1974 and 1975. I still collect cards but there's so many companies it is amazing. Anyway I'm so happy with the Royals Championship because of all the good people in that organization starting with Mr. Art Stewart, George Brett, Puerto Rico Scout Johnny Ramos, Dayton Moore, JJ Picollo, Ned Yost, Mike Jirschele, Alex Rios, Christian Colon and Edinson Volquez by emulating his fathers passing RIP. So congratulations to the KC Royals on a great season and Love The Game." 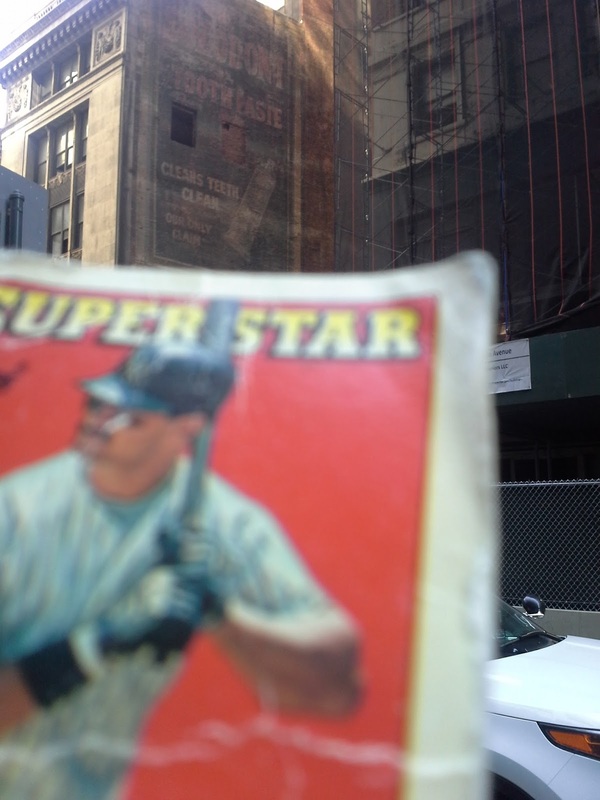 Like most cities, New York has a lot of old painted advertising signs on the sides of old buildings. This one for Sozodont toothpaste has been on this building on Vanderbilt Avenue and 43rd Street for over a century; for most of that time it was hidden by a neighboring building. That building was recently torn down, exposing this relic that advertised a toothpaste brand briefly popular in the late nineteenth century. (It's popularity faded in the early 1900s as its high alcohol content destroyed enamel and turned teeth yellow.) Unfortunately this ad will not exist for much longer; over the next few months all of the buildings on this block are being torn down, to be replaced by a generic glass office tower. I have two cards of James Barthmaier. This one is from 2006 Bowman Prospects. Playing career: James Barthmaier made three starts for the Pirates in 2008. He went 0-2 with a 10.45 ERA. Where he is now: Senior Technology Consultant at GDP Technologies in Georgia. Google Autocomplete results: He is first when you type James Barthm, ahead of James Barthman, a member of the California Building Standards Commission. Another prominent James Barthmaier is a Management and Program Analyst at the US Department of Education.